Around 325 former Penn State players released a statement on Monday in support of a lawsuit filed against the NCAA [National Collegiate Athletic Association] by the family of former Penn State coach Joe Paterno, reports CBS Sports. 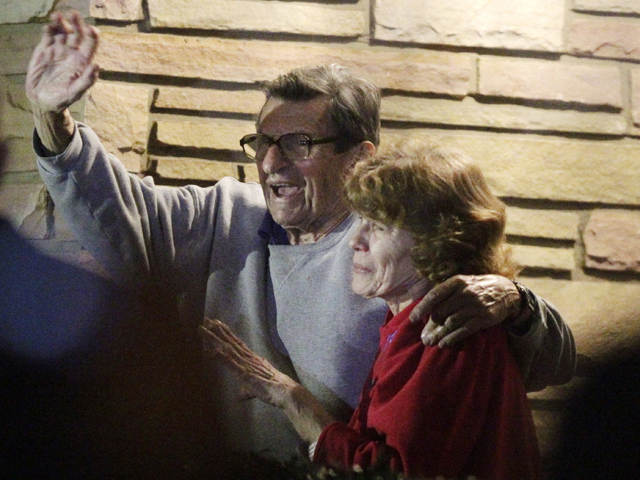 On May 30 the Paterno family filed the lawsuit in an attempt to overturn the NCAA sanctions against Penn State in the wake of the Jerry Sandusky scandal. The group of Penn State players is led by Brian Masella, who graduated from Penn State in 1975 after playing both tight end and punter for the Nittany Lions. Documentary maker: Joe Paterno was "railroaded"
Of the names on the statement the most recognizable would be current Jacksonville Jaguars linebacker Paul Posluszny, former quarterback Kerry Collins and current ESPN analyst Todd Blackledge. "In speaking with a couple former players, we wanted to do something to support the (others) involved in the lawsuit," Masella told the Associated Press in a phone interview. "We had to start somewhere. It basically started to snowball." In the statement the former players demand "fairness, due process, truth, and a just outcome. Everyone -- Sandusky's victims, Penn Staters, and the public at large -- deserves to know the complete truth." Following the Jerry Sandusky scandal at the school the NCAA vacated all of Penn State's wins (111 of them) from 1998 through 2011. The NCAA also fined the school $60 million  with the money going to a child abuse protection program  and took away 40 scholarships from the football program. The program was also put on a five-year probation and banned from postseason play for four years.